Area rugs can be exquisite additions to your home or office. Unfortunately, most rugs don’t come with instruction manuals, so most rug owners don’t know how to properly care for their rugs. Not knowing usually leads to them waiting too long to have them cleaned, or cleaning them with the wrong methods and chemicals, which can contribute to fiber and dye damage from embedded soil, grit, and other contaminants. High end, hand-woven oriental rugs, for example, require a very specific type of cleaning method and careful handling to ensure that their fibers stay intact, colors don’t fade or migrate, and their value is preserved. At Clean Masters, your rugs are treated with care through every step of the process in our rug cleaning facility. Our process includes inspection, dusting, pre spotting, pit washing, drying, fringe cleaning and finishing. Our inspection will determine the best cleaning method for your treasured fine area or Oriental rug. 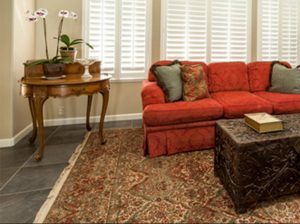 Rugs can be expensive, and knowing how to properly take care of your area rugs can go a long way in preventing damage and ensuring your rugs last for generations. Having your rugs cleaned on a regular basis is the first line of defense against damage. Since embedded soils can cause the fibers of your rug to wear, professional cleaning will help maintain the integrity of the construction of the rug while keeping it looking great. Having your rugs professionally cleaned is the best option when it comes to protecting your rugs and ensuring they last a long time. At Clean Masters, your rugs are treated with care through every step of the process in our state of the art rug cleaning facility. Our process includes inspection, dusting, pre spotting, washing, drying, fringe cleaning and finishing. Our new rug centrifuge gives us a higher efficiency of cleaning which means we can offer our customers the best possible results! Our rug cleaning method extracts soil, sand, grit and grime from the area rugs using our top of the line patented equipment and a residue-free cleaning solution. This process will keep your area rug strong and looking new for years to come. Put your rug in the safe and capable hands of our skilled rug cleaning professionals. Contact our office to schedule your rug cleaning today!